What is Rest Web service? REST stands for Representational State Transfer, which is kind of easiest way to communicate with external systems in Cloud Solution. It is an architectural style for designing networked applications. REST services provide a uniform interface using standard HTTP operations (such as GET, POST, PUT…) and exchange representations of resources. JSON and XML have frequently used formats in REST services. So, I would like to document it here and let you know the same so that it will stay as a reference to everyone. Example: Weather Report (with Params). 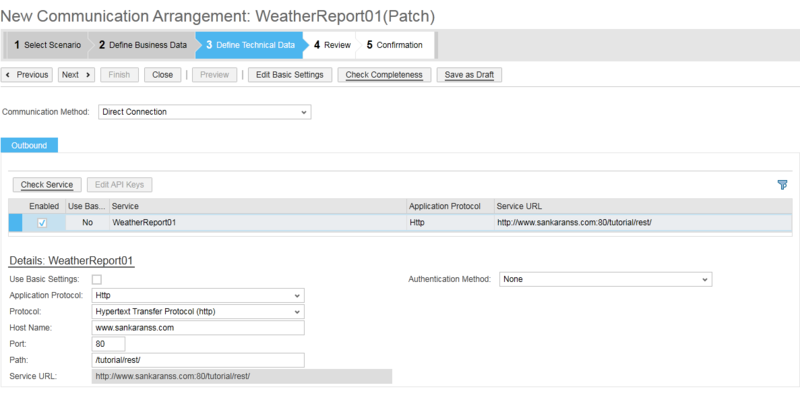 Scenario: Integrate a simple weather API with SAP Cloud Solution. 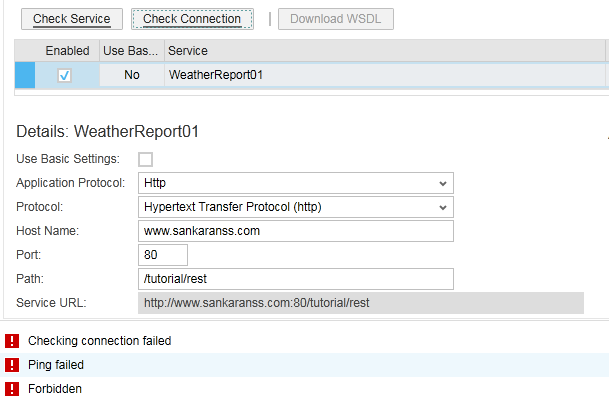 Weather API: www.sankaranss.com/tutorial/rest/weather.php. For time being I created a sample API where it accepts one location parameter. I will keep this API open in case you want to try out. I used free resource for finding weather. So you can get only approximate weather while comparing with Google weather result. Create an External Web Service Using REST. Create A Custom Business Object. Login into the SDK. Select your solution from “My Solution” window. In the Solution Explorer, right-click your solution and select Add New Item. The Add New Item dialog opens. Select SAP Service Integration External Web Service Integration and click Add. The External Web Service Integration Wizard opens. In the Enter Web Service Name and Type step, enter a name for the Web service and select REST. Click Next. Enter www.sankaranss.com/tutorial/rest/ in the URL box. Click Next. The Host Address, Port, and Path fields are filled automatically. Select the Create Communication Scenario checkbox to create a communication scenario. Enter a name for the communication scenario. It must start with a capital letter and can have 25 characters (letters, digits, and underscores). Select the Allow Non-Secure URLs (HTTP) checkbox to allow non-secure communication.Click Next. On the Review page, review your entries and click Finish. 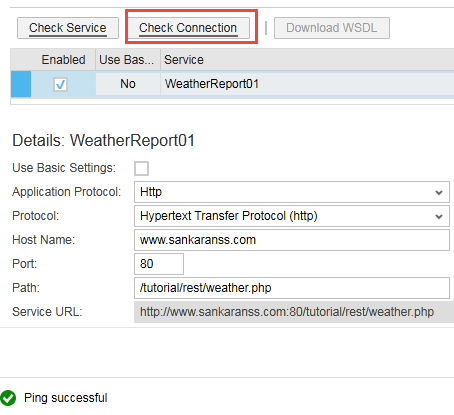 In the Solution Explorer, an external Web service integration file WeatherReport01.wsid and a communication scenario definition file WeatherReport01.csd are displayed. Save and Activate both the files. A communication scenario and a communication system (The communication system is created automatically) are generated in the SAP cloud solution. These can be used to create a communication arrangement. To test the communication scenario, you need to create a communication arrangement in the SAP cloud solution. In the studio, in the Solution Explorer, right-click the communication scenario definition (WeatherReport01.csd) file and click Manage Communication Arrangement. Log on to the SAP cloud solution. The Communication Arrangements work center view opens. The New Communication Arrangement view opens. In the Select Scenario step, select the communication scenario WeatherReport01 which you have created in the studio and click Next. In the Define Business Data step, select the System Instance ID as “WeatherReport01” and click Next. Set Protocol as Hypertext Transfer Protocol(http). In the Review step, review your entries and click Check Completeness. Then click Finish and close. Choose Communication Arrangement (WeatherReport01) -> Technical data -> Edit Advance Settings -> Check Connections. If you see a message as “Ping Successful”, your rest service is perfectly working. If you see any error message, first check your URL and port number. If you have done any modification in URL or in any other options, you have to click “Save and Reactive”, before clicking “Check Connection”. 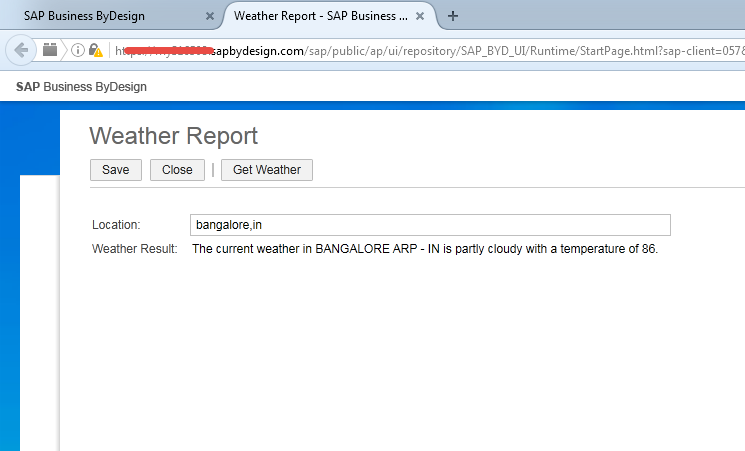 Integrate the Weather Report with SAP Business ByDesign. Create a custom Business Object WeatherReport. Define elements as shown in the below screenshot. Create screens for the WeatherReport BO and Design it. For more information about the Screen creation and Design, see http://blog.sankaranss.com/2016/04/28/sap-byd-screen-types/. 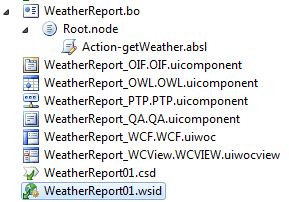 Create getWeather Action script file for WeatherReport BO. Copy and paste below code. Finally, your files look as like below screenshot. Log in as a business user. Navigate to the QA Screen by creating a custom BO instance. You can see Weather Report in Result area. 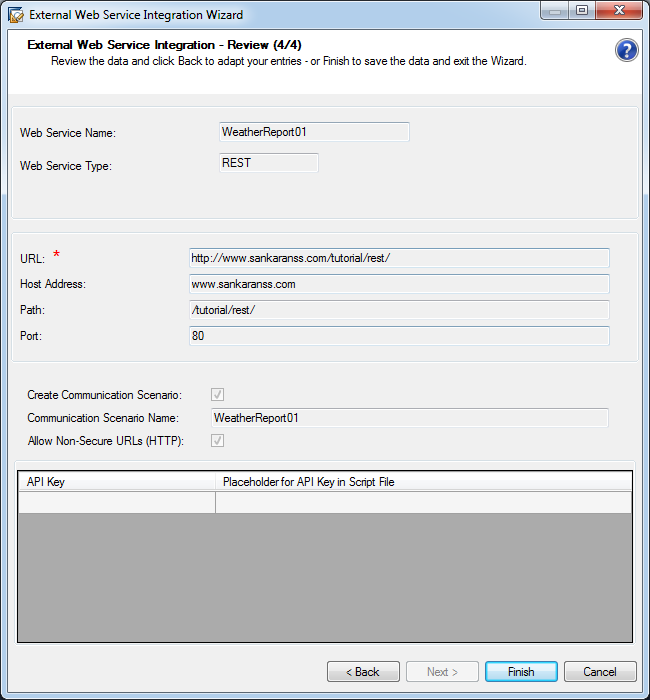 We have seen about integrate weather report with ByDesign using Rest Web service, and in the future article, we will learn more about it. Don’t forget to subscribe my blog and leave your comments to improve this article. If need to download this article as PDF? Thanks a lot for the guide. Informative and fun. Is your API still up and running? I get the following html markup when submitting my location( Knoxville, TN). The directory or file specified does not exist on the Web server. The URL contains a typographical error. A custom filter or module, such as URLScan, restricts access to the file. Create the content on the Web server. Review the browser URL. Create a tracing rule to track failed requests for this HTTP status code and see which module is calling SetStatus. For more information about creating a tracing rule for failed requests, click here. Sorry for the inconvenience. Recently we changed the web server. I will resolve this issue ASAP. Thanks for your valuable comment. You are using the wrong API. Thanks. I will alter and try again!